Add protection and a dash of panache to your 9.7" iPad Pro with the charcoal gray Smart Cover from Apple. The cover snaps on and off for easy installation and removal. Functioning as a two-position stand, the cover folds for typing at a slightly inclined angle and viewing movies in an upright position. For use as a flat pad, simply fold the cover over the back of your iPad. The cover is made of sturdy polyurethane with a non-scratch interior. Interior magnets work with your iPad Pro's sleep/wake power conservation functions. The cover is well-designed, providing access to all ports, and the surface texture improves grip while adding protection from dirt, scratches, and moderate impacts. Furthermore, this cover pairs perfectly with the optional Apple Silicone Case. Box Dimensions (LxWxH) 9.5 x 0.57 x 0.3"
Smart Cover for 9.7" iPad Pro (Charcoal Gray) is rated 4.2 out of 5 by 41. Rated 4 out of 5 by Anonymous from Only half a case, but... It loses one star due to being only half a case, in my opinion. However, when paired with the other half, (iPad silicone cover) it's great. I like that I can pull the front half (Smart Cover) off completely when I'm holding it, but I still have the option to just fold it back; it's nice to be able to get it completely out of the way when I want. I was annoyed when I first received it, because I did not realize this only covers the front of the iPad and not the back, but after some research found the other half. I still think it's overpriced though. For both it's over $105, and I think that's too much for a case but I'm pleased with how it works. I guess you get what you pay for. Rated 4 out of 5 by Fearless Leader from Beautiful cover, but.... Absolute beautiful with a fantastic texture that calls for stroking. Absolutely essential for the new iPad Pros. Be warned that covers that were not designed specifically for the iPad Pro will NOT work because the magnets are in different places. The caveat is that this cover was designed to work together with the silicone case and is too big without that case. However, together the two are a perfect match and really add elegance and protection to the iPad Pro. The combination is pricey, but well worth the cost considering what they add (IMHO). Rated 2 out of 5 by Anonymous from Nice slim cover if you add a protective back Very slim design, and due to the magnetic attachment it easily integrated with a clear back cover that I purchased separately (recommended). The inner surface facing the screen is a suede material, and that sounds good for the screen, until you consider that when flipped open, that suede tends to pick up whatever is on the surface you lay it on and cling just a bit better than it would if it were smooth plastic - so flip the cover over and now the scratchy dirt is against your screen. Minor concern, just mentioned it. Rated 4 out of 5 by Tom from Great functionality. Bought this along with the companion silicone case to protect my iPad. They fit perfectly, and certainly provide the protection I desired. The cover automatically awakens the iPad if set to do so which is nice, and folds in such a way auto provide an ad hoc stand for the iPad. Great feature and very handy. Would be a 5* except for the price, but I guess it is Apple, and the design, functionality and quality are all top notch. Rated 2 out of 5 by EJB3288 from If You Want Complete Protection...... Not This Cover! Purchased the Smart Cover the same time that I purchased the 9.7 iPad Pro. Thought I was purchasing the same cover that I had for my iPad Air. It was not. The cover is great if you are only interested in protecting the screen. 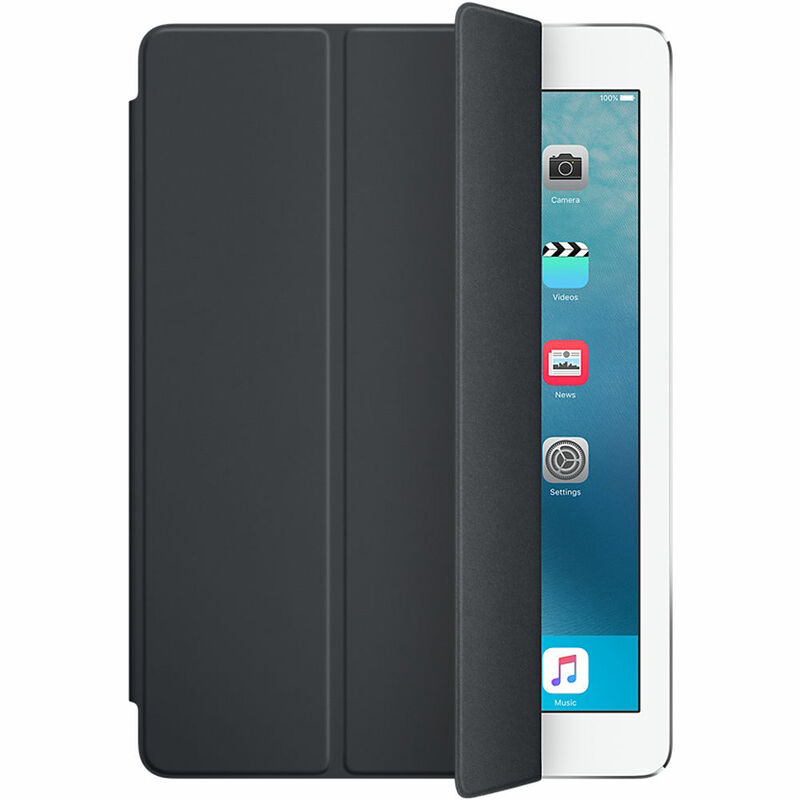 It does not encompass the entire iPad so the back and even the sides are not protected from being scratched. I was disappointed and had to return it, at my own expense. Rated 5 out of 5 by LWINNETKA from Great product The cover snaps in and attachs itself to the iPad Pro with ease. No need to fiddle around. It also automatically turns on the iPad when you lift up the cover without having to push again the power button. Get the other colors though, if your iPad is not white. It tends to get dirty easily and some stains can't be cleaned as the surface material seems to absorb ink or graphite from pencil! Rated 3 out of 5 by Mapotter from Okay I wanted this because of being able to use it as a stand.I was hoping it was like one I have for a Samsung tablet. But, it's not. It only protects the front. It also comes off very easily. I need to get a different cover so that I can protect the whole thing. I wouldn't recommend it, unless you are only concerned about protecting the front when not in use. Rated 2 out of 5 by Anonymous from Awful design I want my entire iPad protected, not just the front glass. There is nothing to protect the back and edges - it only covers the front glass. I could not see this in the pictures and I'm very disappointed. I also don't like the way it feels when I hold the iPad; the edges annoy me. It should be called the Dumb Cover - Ugh! Looking for something better. Does it fit the new iPad 9,7?